It's fitting that light should be added as a topic to the OUP's growing range of mini-guides in 2015, as this is the International Year of Light (though, to be honest, the year seems to have been a nonstarter of an event). Light is a remarkable phenomenon and one that we rarely think about considering how big a part it plays in our lives. Ian Walmsley begins by outlining the reasons why light is so important, over and above the mechanism of sight, and gives a very brief historical view of some of the ideas on the nature of light. I was not impressed by his characterisation of Roger Bacon as the 'mad friar of Oxford', but that apart, though fleeting, the historical section was a reasonable gallop through the topic. For the rest of the content, Walmsley describes optics, light as particles, waves and as a duality in the form of a quantum field. He takes quite an unusual route in doing this and I think it would be easy for a non-technical reader to get somewhat lost along the way. There is quite a long section on special relativity, which, while light-related, is not really the topic of this book, but too little on some aspects of light itself, such as how its speed was first established and measured over the years before settling on the current exact figure. Given the weight that is put on the quantum field description of light, the explanation of quantum fields was too summary, given they remain outside the awareness of most readers. 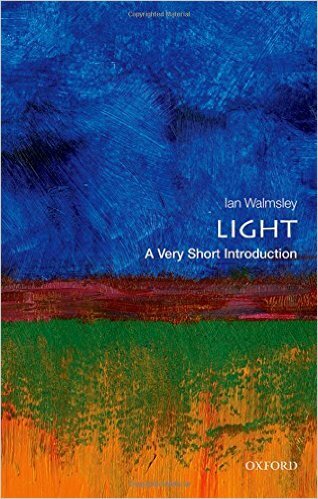 So, a few key omissions and an approach that in some ways isn't ideal for an introductory guide, but still a solid little collection of material on the nature of light.